James Cameron's Avatar: The Game is a 2009 third-person action video game based on James Cameron's 2009 film Avatar. The game was developed by Ubisoft Montreal and released on the PlayStation 3, Xbox 360, Microsoft Windows, Wii and Nintendo DS on December 1, 2009, with a PSP version released later on December 7, 2009. It uses the same technology as the film to be displayed in stereoscopic 3D. As of May 19, 2010, the game has sold nearly 2.7 million copies. The game, which acts as a prequel to the film, features Sigourney Weaver, Stephen Lang, Michelle Rodriguez, and Giovanni Ribisi reprise their roles from the film. The casting and voice production for Avatar: The Game was handled by Blindlight. The online services for the game were shut down on August 8, 2014. A yet untitled sequel/remake is currently in production. Set in 2152, two years before the events of the film, Avatar: The Game starts out with a new signals specialist, named Able Ryder, arriving at Pandora, assigned to an area called Blue Lagoon, a large piece of jungle, fenced in to make sure no larger predators get inside. Their first mission is to save five marines from Viperwolves, with their CO, Kendra Midori, suggesting they use a turret to help fend off the wolves. After saving the marines, Ryder must go help another Sig Spec, Dalton, who is afraid of the Viperwolves and trapped outside the fence. Helping out at another base, Ryder is told to go fix the fences and animal repulsors, which are attracting creatures rather than keeping them away. After fixing the fences, Ryder is told to enter his avatar. Ryder's first mission in his avatar body is to get cell samples from certain non-hostile plants. After getting the samples, a Na'vi, Tan Jala, tells Ryder to kill his infected animals. A RDA air strike is then seen being launched on the Na'vi village where Ryder had locked the signal. He finds out that there is a mole and that it is one of the avatar drivers. He must then follow Tan Jala, who will lead him to the mole. After finding who the mole is, a scientist named Rene Harper, who is sympathetic with the Na'vi plight, Ryder sees the Na'vi village destroyed in the air strike previously. Commander Falco and his soldiers arrive via helicopter and try to force Rene into surrender. Harper then tries to persuade Ryder to join the Na'vi and leave the RDA. When Falco hears this, he orders Ryder to shoot Rene Harper and keep his allegiance to the Corporation. Ryder must then make a game-altering decision of siding with the defensive Na'vi or siding with the more offensive, better- armed RDA. If the player sides with the RDA, Ryder, Commander Falco, and his soldiers corner Rene Harper, and he jumps from a cliff rather than surrender to the RDA. As Rene falls, he shoots Ryder in the chest with a bow and arrow. His avatar is killed, but Ryder's human body survives. As he returns to base on a Scorpion with Kendra, two banshees attack and force down the helicopter. No one is killed, but the pilot is hurt in the crash. Midori informs Ryder of a base near the Crash Site, and that he could use one of the aircraft. However, when he arrives, he finds the base is under constant attack by banshees, resulting in the destruction of many operational Scorpion and Samson helicopters, and causing many casualties. Ryder enters the control room, and the commander tells him to take a helicopter above and destroy the banshee nests, eradicating the banshee threat. When Ryder returns to retrieve missiles from the Crash Site, he learns that the pilot died from his injuries. He reequips the missiles to the helicopter and completes the task, and the player can see that aerial reinforcements are arriving and battling any remaining banshees in the area. Ryder is then ordered to collect three unobtainium shards so that with the help of them he could extract the harmonic from a Willow Tree which would help the RDA to find The Well Of Souls. Ryder collects the shards and then extracts the harmonic. He is again summoned at Hell's Gate and is given a new pilot as his previous pilot died from injuries. He meets with Dr. Monroe who tells him to feed the harmonic into a device called the Emulator. He explains to him that the Na'vi access the planet from a place called the Tree Of Souls, but there is also another dormant site called the Well Of Souls and it could act like a back door entrance for them to cut the connection of the Na'vi from the planet. In order to pinpoint the location of the dormant site they needed enough harmonics. Ryder is transported to a combat area known as the FEBA, where Na'vi warriors, under the powerful Beyda'mo (who, ironically, dislikes Ryder, even if he joins the Na'vi), are inflicting death and destruction to the RDA and slowing the advance to a halt. At this point his primary goal is to collect the shards and extract the harmonic. But in the process he has to kill Beyda'mo. After that he is transported to Grave's Bog where along with collecting the shards and extracting the harmonic he also has to kill Tan jala in the process. He then goes to The Hanging Gardens where he discovers that Dr. Harper is still alive and works for the Na'vi with two other people. After killing them he comes to know that Commander Falco went rogue and has stolen the Emulator and has killed Dr. Monroe. Ryder then travels to The Plains Of Goliath for his final missions. Upon arrival he is ordered to eliminate three Na'vi leaders and the first leader persuades him to join the Na'vi but the player can decline it and after killing the other leaders he is given a Dragon Ship to go to Tantalus and get some charges from Boom Boom Batista and blow up the stone wall and access the Dragon Ship to go to the Well Of Souls. After arriving there he finds that Falco is trying to activate the Emulator. After killing Falco Ryder activates the Emulator and cuts the connection of the Na'vi behind him from Ewya. This finishes the game. However, if the player chooses to accept Swawta's request he has to kill the RDA leaders instead. The Wii and PSP versions have a different storyline, where the player character is a young Na'vi named Raiuk who engages in a personal vendetta against the RDA after they attack his village. At first the player is allowed to choose the appearance of the character from a set of pre-defined faces, although not the name. On the Xbox 360, PlayStation 3 and PC versions, the player is able to choose a side - to fight for the Na'vis or for the RDA - each offering different gameplay, weapon set, skill set, and environment. If the player's health is reduced to 0, they can use a recovery that instantly recovers to full health. Recoveries can be acquired by gathering cell samples left behind by killed creatures (including Humans or Na'vi) or plants, but only 5 Recoveries can be carried at any one time (excluding the PS3 version, which has a limit of 10). Avatar players can collect Cell Samples more easily from many plants without having to "kill" them. If the player falls to his death, however, he cannot use Recoveries and have to reload from a check point which is automatically saved. The game offers no way to manually save when playing the game (it is only saved when player reach certain points, completed an objective, or quit the game). A special case involves a separate checkpoint when the user decides which race to side with, which cannot be overwritten. As the player completes mission objectives or eliminates opposition, the character gains experience points and levels up. The leveling up process is quite linear, with no way to customize the character. Each level rewards the character with better versions of the weapons, armor and skills they already have. The character can have only one armor (one type of combat gear at a time, though with higher levels, different types become available, which may be selected instead of the original), four skills and four weapons equipped into quick slot at any one time. The skills can be offensive (boost damage, summon air strikes / wild life), defensive (boost damage resistance, heal) or tactical purpose (boost speed, invisibility). The Wii version of the game uses the Wii Remote controller for combat, and the firing of bows. The Xbox version has a wider range of controls and allows the player to ride animals and drive vehicles. 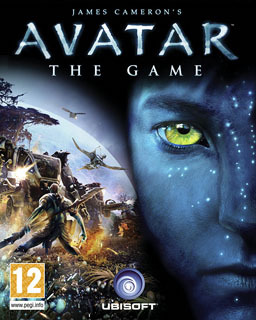 On July 24, 2007, it was announced that Ubisoft would be developing Avatar: The Game in conjunction with director James Cameron as he filmed Avatar. According to Cameron, "For the movie Avatar we are creating a world rich in character, detail, conflict and cultural depth. It has the raw material for a game that the more demanding gamers of today will want to get their hands on - one that is rich in visuals and ideas, and challenging in play." While Sigourney Weaver, Michelle Rodriguez, and Stephen Lang reprised their voices for their characters, Sam Worthington and Zoe Saldana, leading roles in the film, did not. The game was developed as an adaptation of the movie of the same name, with an original storyline and similar features. The developers had carte blanche from the movie. The idea originally came from James Cameron's daughter Mary Cameron and she thought it would be a good idea to create a game for the movie. On August 27, 2009, MovieScore Magazine reported that composer Chance Thomas had been hired to write the music for Avatar: The Game. It was unclear at the time whether the score would contain pieces of the original score composed by James Horner for the movie. The game requires an HDMI video connection and a 120 Hz capable display in order to make use of the 3D effects. Avatar: The Game has the option of outputting in most standard stereoscopic 3D formats used by today's "3D-enabled" screens with stereoscopic 3D. The release of the PC demo has confirmed the PC version of the game supports 3D capabilities as well. According to Neil Schneider, executive director of the S-3D Gaming Alliance, NVIDIA has developed a proprietary method for NVIDIA's GeForce 3D Vision that allows left and right images to be passed directly from the game engine to the PC display, in the form of quad buffers. Up until Avatar, this was a limitation criticized by the gaming industry because they were forced to use NVIDIA's stereoscopic 3D driver when they would prefer to have full control of the S-3D gaming experience. Alternate solutions like iZ3D monitors, interlaced displays, dual output projectors and 3D Checkerboard DLP do not require this enhancement because game developers have full output control. Avatar: The Game received mixed reception. Many critics criticized the game's linear gameplay and unintuitive controls, and the Wii version received mediocre scores as well, with many reviewers citing poor camera work, frame rate and story telling, but visuals and controls were regarded comparatively well. GameRankings and Metacritic gave the game a score of 81.14% and 78 out of 100 for the iOS version; 64.26% and 61 out of 100 for the Xbox 360 version; 60.34% and 60 out of 100 for the PlayStation 3 version; 58% and 55 out of 100 for the DS version; 57.42% and 60 out of 100 for the Wii version; 54.44% and 59 out of 100 for the PC version; and 39% and 55 out of 100 for the PSP version. Sales of the game had a slow start but eventually performed ahead of expectations selling 2.7 million units across all platforms. Ubisoft CEO Yves Guillemot called the game a "positive contribution for the company" citing the increased sales due to the film's success and its launch on DVD. ^ Inon Zur composed the game for the Nintendo DS. ^ "Avatar Mobile, iPhone & iPad games by Gameloft". Avatariphonegame.com. Retrieved 2011-10-17. ^ "James Cameron's Avatar Release Information for iOS (iPhone/iPad)". GameFAQs. Retrieved June 23, 2014. ^ "James Cameron's Avatar for iPad Release Information for iOS (iPhone/iPad)". GameFAQs. Retrieved June 23, 2014. ^ "James Cameron's Avatar Release Information for Android". GameFAQs. Retrieved June 23, 2014. ^ Ubisoft (2007-07-24). "Ubisoft and Fox Team for Avatar Game". Comingsoon.net. Archived from the original on September 22, 2007. Retrieved 2007-07-25. ^ Miller, Ross (2007-07-24). "Miller, Ross; "James Cameron selects Ubisoft to adapt Avatar"; joystiq.com; July 24, 2007". Joystiq.com. Retrieved 2009-06-04. ^ "Ubisoft's Avatar to get 3D treatment - PlayStation Universe". Psu.com. Retrieved 2009-06-04. ^ Thorsen, Tor (2009-12-04). "Avatar game sells nearly 2.7 million - Xbox 360 News at GameSpot". Uk.gamespot.com. Archived from the original on 2012-07-16. Retrieved 2011-10-17. ^ "Online Services Update Masterlist". Ubisoft. Retrieved March 12, 2018. ^ "'Avatar' game requires HDMI for 3D effects". Joystiq. ^ "Official Stereoscopic FAQ - Forums". Archived from the original on 2012-03-21. ^ "The S-3D Gaming Alliance". S3dga.com. 1996-01-01. Archived from the original on 2011-10-09. Retrieved 2011-10-17. ^ MTBS-TV Broadcast, Resident Evil 5 Review, DDD Update! ^ a b "James Cameron's Avatar for iPhone/iPad". GameRankings. Retrieved June 23, 2014. ^ a b "James Cameron's Avatar: The Game for Xbox 360". GameRankings. Retrieved June 23, 2014. ^ a b "James Cameron's Avatar: The Game for PlayStation 3". GameRankings. Retrieved June 23, 2014. ^ a b "James Cameron's Avatar: The Game for DS". GameRankings. Retrieved June 23, 2014. ^ a b "James Cameron's Avatar: The Game for Wii". GameRankings. Retrieved June 23, 2014. ^ a b "James Cameron's Avatar: The Game for PC". GameRankings. Retrieved June 23, 2014. ^ a b "James Cameron's Avatar: The Game for PSP". GameRankings. Retrieved June 23, 2014. ^ a b "James Cameron's Avatar for iPhone/iPad Reviews". Metacritic. Retrieved June 23, 2014. ^ a b "James Cameron's Avatar: The Game for Xbox 360 Reviews". Metacritic. Retrieved June 23, 2014. ^ a b "James Cameron's Avatar: The Game for PlayStation 3 Reviews". Metacritic. Retrieved June 23, 2014. ^ a b "James Cameron's Avatar: The Game for Wii Reviews". Metacritic. Retrieved June 23, 2014. ^ a b "James Cameron's Avatar: The Game for PC Reviews". Metacritic. Retrieved June 23, 2014. ^ a b "James Cameron's Avatar: The Game for DS Reviews". Metacritic. Retrieved June 23, 2014. ^ a b "James Cameron's Avatar: The Game for PSP Reviews". Metacritic. Retrieved June 23, 2014. ^ Sterling, Jim (December 6, 2009). "Review: James Cameron's Avatar: The Game (X360)". Destructoid. Retrieved June 23, 2014. ^ Edge staff (January 2010). "James Cameron's Avatar: The Game (X360)". Edge: 84. ^ Bramwell, Tom (December 1, 2009). "James Cameron's Avatar: The Game (Xbox 360)". Eurogamer. Retrieved June 23, 2014. ^ Marchiafava, Jeff (February 2010). "Avatar: The Game: Mediocrity Invades The Planet Of Pandora". Game Informer (202). Retrieved June 23, 2014. ^ Mirkovich, Sean (December 1, 2009). "Avatar (PS3)". GamePro. Archived from the original on December 4, 2009. Retrieved June 23, 2014. ^ VanOrd, Kevin (December 1, 2009). "James Cameron's Avatar: The Game Review". GameSpot. Retrieved June 23, 2014. ^ VanOrd, Kevin (December 2, 2009). "James Cameron's Avatar: The Game Review (PC)". GameSpot. Retrieved June 23, 2014. ^ VanOrd, Kevin (December 9, 2009). "James Cameron's Avatar: The Game Review (PSP)". GameSpot. Retrieved June 23, 2014. ^ Rybicki, Joe (December 2, 2009). "The Consensus: Avatar: The Game Review". GameSpy. Retrieved June 23, 2014. ^ "James Cameron's Avatar: The Game Review (X360)". GameTrailers. December 3, 2009. Retrieved June 23, 2014. ^ Lafferty, Michael (December 1, 2009). "James Cameron's Avatar: The Game". GameZone. Archived from the original on December 6, 2009. Retrieved June 23, 2014. ^ Shoemaker, Brad (December 11, 2009). "James Cameron's Avatar: The Game Review (X360)". Giant Bomb. Retrieved June 23, 2014. ^ Buchanan, Levi (December 15, 2009). "Avatar: The Game Review (iPhone)". IGN. Retrieved June 23, 2014. ^ Buchanan, Levi (October 15, 2010). "Avatar: The Game Android Review". IGN. Retrieved June 23, 2014. ^ Brudvig, Erik (December 1, 2009). "Avatar: The Game Review". IGN. Retrieved June 23, 2014. ^ Kolan, Patrick (December 1, 2009). "Avatar: The Game AU Review". IGN. Retrieved June 23, 2014. ^ Buchanan, Levi (April 28, 2010). "Avatar iPad Review". IGN. Retrieved June 23, 2014. ^ Meer, Alec (December 1, 2009). "Avatar: The Game UK Review". IGN. Retrieved June 23, 2014. ^ Harris, Craig (December 1, 2009). "Avatar Review (Wii)". IGN. Retrieved June 23, 2014. ^ "James Cameron's Avatar: The Game (DS)". Nintendo Power. 248: 87. January 2010. ^ "James Cameron's Avatar: The Game (Wii)". Nintendo Power. 248: 88. January 2010. ^ Clark, Alex (December 3, 2009). "Avatar". Official Xbox Magazine. Archived from the original on December 6, 2009. Retrieved June 23, 2014. ^ "James Cameron's Avatar: The Game". PC Gamer: 84. January 2010. ^ "James Cameron's Avatar". The A.V. Club. January 11, 2010. Retrieved June 23, 2014. ^ Mastrapa, Gus (December 7, 2009). "Avatar: The Game (X360)". The A.V. Club. Archived from the original on October 17, 2010. Retrieved June 23, 2014. ^ "Avatar The Video Game Is A Flop". Business Insider. 18 January 2010. ^ "Avatar popularity pushes game sales to 2.7 million units". The Tech Herald. This page was last edited on 24 February 2019, at 16:25 (UTC).